It took quite the will to write this review, as I'm currently sitting overlooking the beach in Tahiti. Now, personally I don't really like sitting on the beach, but this trip is completely free (flights, and a suite at the Radisson, so this time, I'm not complaining at all). My first of many flights in order to get from Seoul to Tahiti involved a 3 day stopover in Japan. Enroute to Hokkaido, I stopped in Tokyo for the day and I was able to try the 2nd of 4 new burgers for Japan's annual 'Big America' promotion. 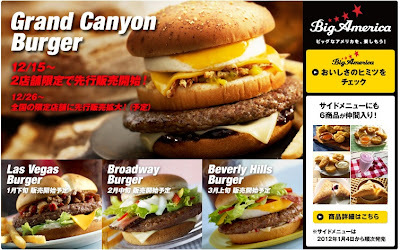 Sadly, I missed the first burger - The Grand Canyon burger, by only 2 days the last time I was in Japan, so I was glad I was able to get this one before it was gone. Also, for the promotion McDonald's were offering 2 separate side dishes to accompany each new burger. The first month (the ones I missed, along with the Grand Canyon) were a Cherry Cheesecake Pie, and some special nugget dipping sauce. Paired with my Las Vegas Burger, they had another unique nugget dipping sauce (which I didn't try), and the Maple Custard Pie, which I happily ordered along with my set. The Big America promo throughout the last 3 years has always had the same format. A small bun, covering a large patty, and some strange sauce that any 'American' would never have on a burger, but I guess in Japan, if you put 'America' in the name, its bound to sell. Sadly using the promo photo (which you can see near the top of the post), the Grand Canyon looked the most interesting, with an egg, some fried onion and some unidentifiable sauce, and the Las Vegas looking the most tame. The photo that I personally took of the burger is hiding a mass of sauce that fell out of the bun on the opposite side. I don't know if the person who put the sauces (in this variant, being the only unique thing on the burger) just got sloppy, or if it slid out as I unwrapped the burger. The sauces, which I managed to scoop back on top of the patty before trying, were rather unexciting. 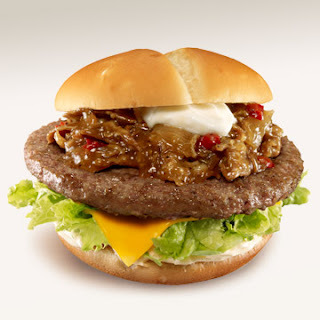 The first was a beef/onion mix, which slightly different from the KBQ Burger I recently reviewed, was still too similar for me to think 'oh wow, something new'. The second sauce which I originally thought was mayo, was actually cream cheese, and though I don't think it could have been 100% cheese, as it was too light and tasteless, it may have very well been mixed with mayo, as the Japanese have a habit of doing that. As I have said before in my Japanese reviews, the meat here is not spiced enough for my liking, and being a bigger than usual patty, it really allowed the blandness to stand-out more than usual. The pie was surprisingly good, though Custard and Maple Syrup are two things that would never come to mind when thinking of Las Vegas. I visited this McD's around lunch time, and it seemed that nearly every person that ordered also ordered this pie. It was very similar up in -14 degree Hokkaido a few days later when I stopped into McD's to have a promo 100Y coffee, I didn't see anyone having the Las Vegas Burger, but I counted 14 people have the pie in the 15 minutes I was warming up. The pie had a nice, warm, flaky crust, a surprising amount of custard, and just the right amount of maple syrup. Though my photos do not do it justice, if you are in Japan over the next few weeks, give it a try before its gone. Coupled with the 100Y coffee they are promoting all month, its a nice winter snack. 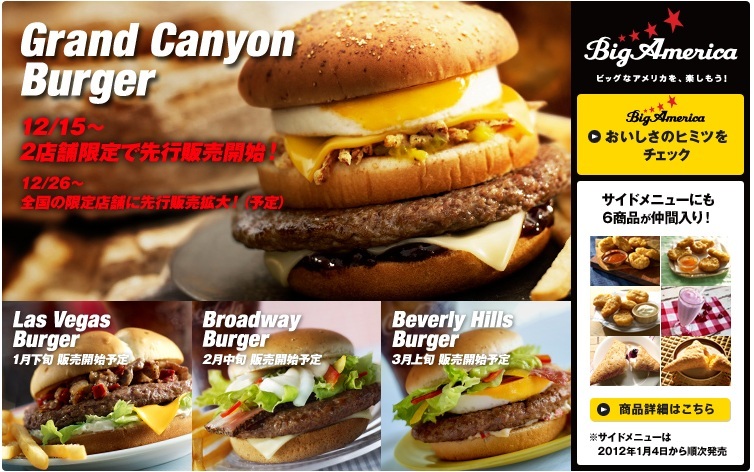 Looks like when I stop in Tokyo again on the way to Palau next week, I'll be able to hit the 3rd burger of the promo, The Broadway Burger, so stay tuned for that review. I still would be more interested in the meat than pie.